For the launch of the Lexus IS Series, the luxury car manufacturer wanted to make an impression on its potential clients. Marketed as a brand that ensures quality engineering and world class luxury vehicle standards, the launch of the second generation IS series needed to exude the same qualities. 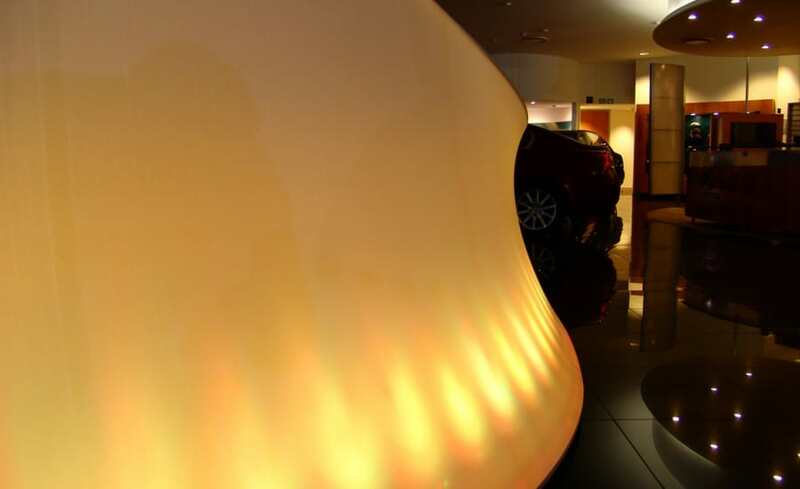 Architen Landrell were approached to conceive, design and manufacture sixty waveform screens to provide stylish backdrops to car showrooms across the country. 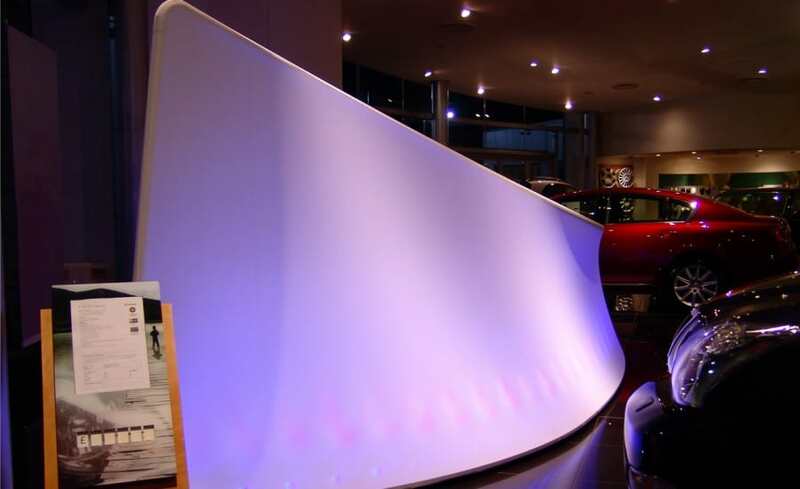 Situated in every UK Lexus dealership, the self-assembly screens are internally illuminated using LED lighting capable of displaying 16.7 million colours, pre-programmed with several lighting sequences so that the fabric emits a flowing, kinetic glow from within. In order to ensure ease of installation by untrained showroom staff, the screens were designed using a curved powder-coated tubular metal frame on a two-part MDF base, with a stretch fabric sock cover designed to fit perfectly over the top. The whole project programme from initial concept design to distribution of the completed kits took Architen Landrell less than one month from receipt of order, a remarkable timescale considering the complexity of integrating RGB LED lighting into a bespoke five-metre long freestanding monolith that had to be shipped in kit form for self-assembly. However, the project was undeniably a success and both Lexus and their dealerships were thoroughly pleased with the end result. 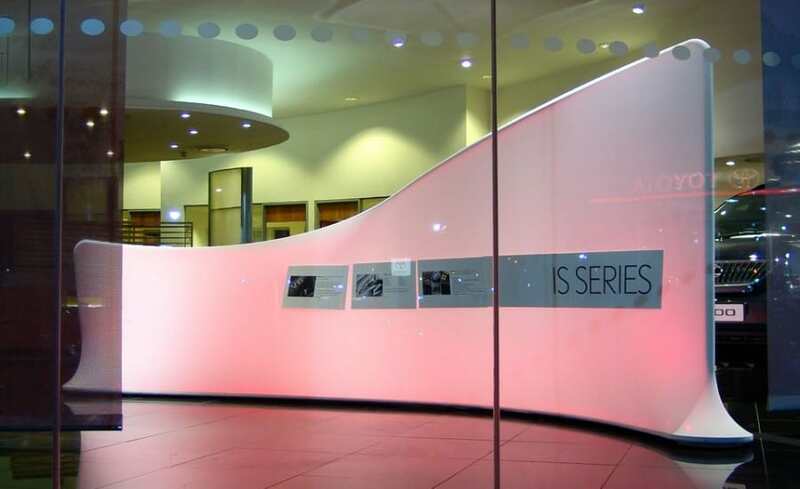 Architen Landrell can develop completely bespoke variations of the waveform screen to individual client specifications, and the frames and fabric skins can be adapted to house floating LCD screens or promotional graphic panels.